When you book online at www.stauntonsonthegreen.ie we guarantee you the best price available for your chosen rooms or special offer packages. If you find a lower rate elsewhere on the Internet within 24 hours of making your reservation on www.stauntonsonthegreen.ie and the rate is for the same date(s), same room type, same number of guests and the same rate terms or restrictions, we will honour the lower rate. The Best Online Rate Guarantee applies only to online rates available to the general public. Group rates, corporate rates, wholesale rates, association rates or rates which are part of a travel package do not qualify. Stay with us on a bed and breakfast basis and rest assured you are booking with us at the best available rate here on our official website. Free cancellation up to 48 hours prior to arrival. Located in the heart of historic Dublin, whether you’re here for business or pleasure we have a room to suit your needs. 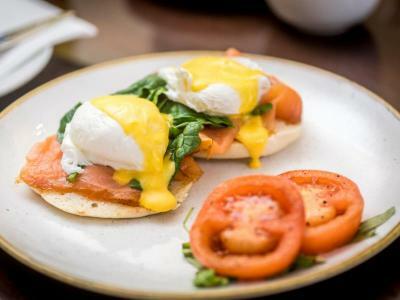 Enjoy a freshly prepared breakfast in the morning. Located on St. Stephen’s Green | Complimentary bottled Irish Spring Water | In room fans | Complimentary high-speed Wi-Fi | Tea/Coffee making facilities | Multichannel TV | VOYA Irish natural organic seaweed based toiletries in every room.